LIMBO, the resting place for the souls of unbaptised children, is being written out of Catholic teaching. The concept, which developed during the Middle Ages, was never official doctrine and now Pope Benedict XVI will abolish it. According to sources reported in London's The Times, the Vatican's International Theological Commission will recommend tomorrow that it be replaced by a more compassionate doctrine that children who die do so "in the hope of eternal salvation". The Pope is expected to agree because, as Cardinal Joseph Ratzinger, he presided over the first sessions of the commission, which had been asked to examine the matter by the late pope John Paul II. And as long ago as 1984 the then cardinal told Catholic author Vittorio Messori that limbo had "never been a definitive truth of the faith". "Personally I would let it drop, since it has always been only a theological hypothesis," he said. Australian Catholic University professor Neil Ormerod called the move a piece of "theological housekeeping". "A lot of Catholics, especially those of an older generation, would have grown up with the notion of limbo in their catechism teaching but it was never an official teaching of the church," Professor Ormerod said. "It was a theological position." The old catechism, adopted under the papacy of Pius V from 1903 to 1914, defined limbo as a place where the dead "do not have the joy of God but neither do they suffer ... they do not deserve Paradise, but neither do they deserve Hell or Purgatory". It takes its name from the latin word limbus, meaning hem, edge or boundary. There is an Akathist of Thanksgiving that was composed by one of the New Martyrs of Russia, Protopresbyter Gregory Petrov, while in a Soviet prison camp, where he later died. You can read that text here. You can purchase a recording of this akathist here. By Dennis Prager, Dennis Prager's nationally syndicated radio show is heard daily in Los Angeles on KRLA-AM (870). He may be contacted through his website: www.dennisprager.com. THE RIOTING IN France by primarily Muslim youths and the hotel bombings in Jordan are the latest events to prompt sincere questions that law-abiding Muslims need to answer for Islam's sake, as well as for the sake of worried non-Muslims. (1) Why are you so quiet? Since the first Israelis were targeted for death by Muslim terrorists blowing themselves up in the name of your religion and Palestinian nationalism, I have been praying to see Muslim demonstrations against these atrocities. Last week's protests in Jordan against the bombings, while welcome, were a rarity. What I have seen more often is mainstream Muslim spokesmen implicitly defending this terror on the grounds that Israel occupies Palestinian lands. We see torture and murder in the name of Allah, but we see no anti-torture and anti-murder demonstrations in the name of Allah. There are a billion Muslims in the world. How is it possible that essentially none have demonstrated against evils perpetrated by Muslims in the name of Islam? This is true even of the millions of Muslims living in free Western societies. What are non-Muslims of goodwill supposed to conclude? When the Israeli government did not stop a Lebanese massacre of Palestinians in the Sabra and Chatilla refugee camps in Lebanon in 1982, great crowds of Israeli Jews gathered to protest their country's moral failing. Why has there been no comparable public demonstration by Palestinians or other Muslims to morally condemn Palestinian or other Muslim-committed terror? If Israeli occupation is the reason for Muslim terror in Israel, why do no Christian Palestinians engage in terror? They are just as nationalistic and just as occupied as Muslim Palestinians. According to Freedom House, a Washington-based group that promotes democracy, of the world's 47 Muslim countries, only Mali is free. Sixty percent are not free, and 38% are partly free. Muslim-majority states account for a majority of the world's "not free" states. And of the 10 "worst of the worst," seven are Islamic states. Why is this? Young girls in Indonesia were recently beheaded by Muslim murderers. Last year, Muslims — in the name of Islam — murdered hundreds of schoolchildren in Russia. While reciting Muslim prayers, Islamic terrorists take foreigners working to make Iraq free and slaughter them. Muslim daughters are murdered by their own families in the thousands in "honor killings." And the Muslim government in Iran has publicly called for the extermination of Israel. (5) Why do countries governed by religious Muslims persecute other religions? No church or synagogue is allowed in Saudi Arabia. The Taliban destroyed some of the greatest sculptures of the ancient world because they were Buddhist. Sudan's Islamic regime has murdered great numbers of Christians. Instead of confronting these problems, too many of you deny them. Muslims call my radio show to tell me that even speaking of Muslim or Islamic terrorists is wrong. After all, they argue, Timothy McVeigh is never labeled a "Christian terrorist." As if McVeigh committed his terror as a churchgoing Christian and in the name of Christ, and as if there were Christian-based terror groups around the world. As a member of the media for nearly 25 years, I have a long record of reaching out to Muslims. Muslim leaders have invited me to speak at major mosques. In addition, I have studied Arabic and Islam, have visited most Arab and many other Muslim countries and conducted interfaith dialogues with Muslims in the United Arab Emirates as well as in the U.S. Politically, I have supported creation of a Palestinian state and supported (mistakenly, I now believe) the Oslo accords. Hundreds of millions of non-Muslims want honest answers to these questions, even if the only answer you offer is, "Yes, we have real problems in Islam." Such an acknowledgment is infinitely better — for you and for the world — than dismissing us as anti-Muslim. 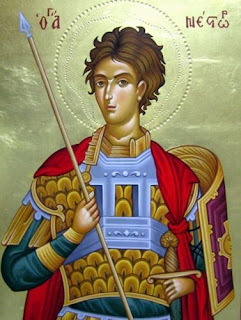 Today we celebrate the memory of the Holy Martyr Nestor of Thessalonica, who is not nearly as well known as the saint he was associated with... St. Demetrius of Thessalonica. What should be noted is that St. Nestor took up arms to kill a man who was murdering innocent Christians, but he first asked for and received a blessing from St. Demetrius to do so. St. Nestor would no doubt have been more than happy to turn his own other cheek, had the occassion called for it; but he could not turn the other cheek for those were helpless. Just as Scripture commands us to turn the other cheek, it also commands us to defend the helpless, and this is what he did. The following is the entry for October 27 o.s. / November 9th n.s. from the Prologue of Ochrid, by St. Nikolai Velimirovich. In the time of the suffering of St. Demetrius the Myrrh-gusher, there was a young man of Thessalonica, Nestor, who learned the Christian Faith from St. Demetrius himself. At that time Christ's enemy, Emperor Maximian, organized various games and amusements for the people. The emperor's favorite in these games was a Vandal by the name of Lyaeus, a man of Goliath-like size and strength. As the emperor's gladiator, Lyaeus challenged men every day to single combat and slew them. Thus, the bloodthirsty Lyaeus amused the bloodthirsty, idolatrous Maximian. The emperor built a special stage for Lyaeus's battles, similar to a threshing floor on pillars. Spears, points upward, were planted beneath this platform. When Lyaeus defeated someone in wrestling, he would throw him from the platform onto the forest of spears. The emperor and his pagan subjects cheered as some poor wretch writhed in torment on the spears until he died. Among Lyaeus's innocent victims were many Christians: when no one volunteered to duel with Lyaeus, by the emperor's orders Christians were arrested and forced to duel with him. Seeing this horrifying amusement of the pagan world, Nestor's heart was torn with pain, and he decided to come forward for a duel with the gigantic Lyaeus. But first, he went to prison to see St. Demetrius and sought a blessing from him to do this. St. Demetrius blessed him, signed him with the sign of the Cross on the forehead and on the chest and prophesied to him: ``You will defeat Lyaeus, but you will suffer for Christ.'' Thus, young Nestor went to duel with Lyaeus. Maximian was present with a multitude of people; everyone felt pity for the young Nestor, who would surely die, and tried to dissuade him from dueling with Lyaeus. Nestor crossed himself and said: ``O God of Demetrius, help me!'' and with God's help, he overcame Lyaeus, knocked him down, and threw him onto the sharp spears, where the heavy giant soon found death. Then all the people cried out: ``Great is the God of Demetrius!'' But the emperor, shamed before the people and sorrowing for his favorite Lyaeus, was greatly angered at Nestor and Demetrius, and commanded that Nestor be beheaded and Demetrius run through with lances. Thus, the Christian hero Nestor ended his earthly life and took up his habitation in the Kingdom of his Lord in the year 306. And was zealous for the Christian Faith. And impaled the powerful Lyaeus on a spear. And as he said, so it came to pass. And fervent prayers for the Church. And Nestor was eternally glorified. By the way, if you are interested in getting a copy of the Prologue, click here. It is a great way to read the lives of the saints for each day, and also to read other short but edifying comments from St Nikolai Velimirovich. As you read the following, remember that the Democrats cannot bring themselves to condemn this... even in the 9th month of pregnancy. THE COURT: Can you explain to me what that means. THE WITNESS: What they did was they delivered the fetus intact until the head was still trapped behind the cervix, and then they reached up and crushed the head in order to deliver it through the cervix. THE COURT: What did they utilize to crush the head? THE WITNESS: An instrument, a large pair of forceps that have a round, serrated edge at the end of it, so that they were able to bring them together and crush the head between the ends of the instrument. THE COURT: Like the cracker they use to crack a lobster shell, serrated edge? THE COURT: Describe it for me. THE COURT: Except here you are crushing the head of a baby. "They forget, or will not remember, that human sacrifices and the power of an idolatrous priesthood - a system of profligacy unparalleled in another part of the world - infanticide, a consequent of that system - bloody wars, where conquerors spared neither women nor children - that all these have been abolished; and that dishonesty, intemperance, and licentiousness have been greatly reduced by Christianity. In a voyager to forget these things is base ingratitude; for should he chance to be at the point of shipwreck on some unknown coast, he will most devoutly pray that the lesson of the missionary may have reached thus far." "The lesson of the missionary is the enchanter's wand. The house has been built, the windows framed, the fields ploughed, and even the trees grafted by the New Zealander." Actually, the communists probably killed 100 million in China alone... but this is a cool t-shirt, any way. The Baptism of Rus, in 988 A.D.
Moscow, November 1, Interfax - The number of ethnic Muslims in Russia who adopted Christianity is 2 million, while the number of the Orthodox who have been converted to Islam is only 2,5 thousand, stated Roman Silantyev, executive secretary of the Inter-religious Council in Russia. 'Christianization happens not so much as a result of some purposeful missionary activity (in which only Protestants are engaged) as under the influence of Russian culture which has express Christian roots', Silantyev said in a interview published this week by the Itogi weekly. According Silantyev, the converts are predominantly Muslims by birth, while 'those who really confess Islamic values and attend mosque on a regular basis rarely change their faith'. 'The assimilation of ethnic and religious minorities is an inevitable process in any society. In Russia it is accelerated due to extremist activities', the Islamic researcher believes. For instance, he says, as a result of what happened in Beslan, the proportion of Muslims in North Ossetia has decreased at least by 30%, while in Beslan itself, where Muslims had comprised from 30 to 40% of the population, their number has decreased at least by half. 'As even Muslim sources confirm, after each terrorist action, thousands and may be even dozens of thousands of ethnic Muslims adopt baptism', Silantyev stated. At the same time, the expert accounts for the small number of ethnic Orthodox people who have adopted Islam for the last 15 years, among other things, by the fact that 'for some reason Russians seem to be more willing to join sects than Islam'. A musical and slide-show tribute to our troops.